Successfully Added 10.1 Inch Touch Screen USB Monitor to your Shopping Cart. 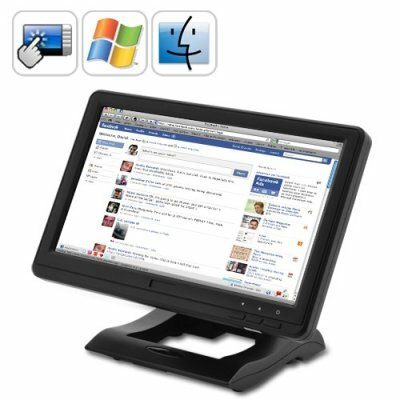 New 10.1 Inch Touch Screen USB Monitor, perfect for those who want an additional monitor without additional clutter. With the innovative USB-only connection, video, power and touch screen are sent through one single USB cable, so just connect and go for an instant and convenient additional display! Pair this 10.1 inch USB connected and powered LCD mini monitor to your notebook or desktop computer for an efficient and affordable way to increase productivity. It is ideal for keeping your main display clutter free and dedicating visual workspace to applications that are used at a glance, and you can even connect as many additional monitors together as you wish! Along with the accurate 4-wire resistive touch panel, managing your applications (and life) becomes so much easier and takes a single finger press. If you need an additional monitor that has maximum convenience and ultimate affordability, the 10.1 Inch Touch Screen USB Monitor is ideal. It is in our warehouse now and brought to you at our usual low factory-direct wholesale price. Order now and we will express ship it tomorrow, guaranteed! Brought to you by the leader in wholesale electronics and computer accessories - Chinavasion. Connect as many additional monitors as you want! What software do I need to install and where do I get it? Everything is available on the CD that comes with the product. To get the monitor working, you will need to install the drivers for your operating system in the "usb monitor drivers" folder. To get the touch screen working, you will need to install the drivers in the "touchkit-drivers" folder. How many additional USB monitors can I connect together? As many as you want! However, only the first is powered by USB only. Others will need to be plugged into the wall with the DC adapter. The touchscreen is great, but how do I make it even more accurate? Use the software and run "4 points calibration" for quick calibrating and then run "linearization" for maximum accuracy. It even has a "draw test" to let users test the touchscreen accuracy.